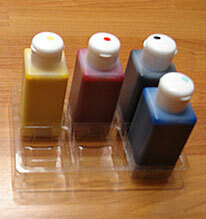 Stylus Photo C120 / C110 is a 4-Color Ink Jet Printer (Cyan, Magenta, Yellow, and Dual-Black ink). With our InkRepublic C120 / C110 i-INK2 Bulk Ink Kit, you can convert your printer into a non-stop continuously printing monster. No Banding, No Horizontal Lines during high-speed printing. 1. 5x Dampers with Ink Tubes, Ink Stopper, and Vacuum Pump. In order to install C120 ink system, removal of the original cartridge lid and installing our own lid will be necessary.